If you have a family or are just interested in going on a relaxing cruise around famous Lady Bird Lake without the hustle and bustle of traffic, then our Peace Love and Zilker tour is just for you! Our knowledgeable guides will show you the sights such as Auditorium Shores, the Stevie Ray Vaughn Statue, The Old Railroad Bridge, Zilker Park, Barton Springs Pool and much much more! Learn the history of every place we stop and be sure to bring a camera for the many picturesque photo opportunities! The customers will arrive at shop 15 minutes before tour departure time and get custom fitted to bikes according to size. Our tour guide will then go over safety rules and bike operation. 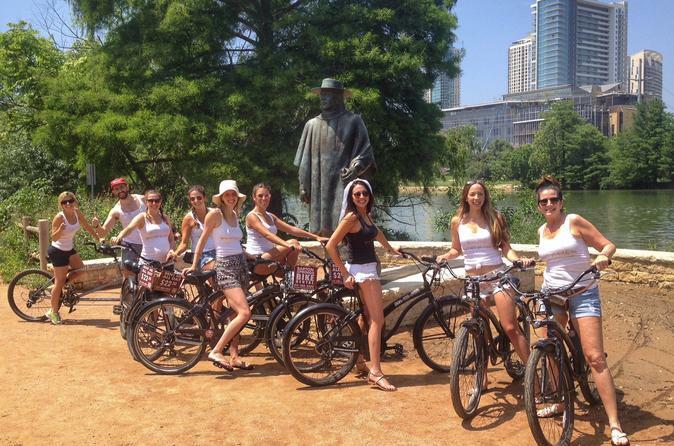 Each customer will receive a complementary water.They will then depart on a one and a half hour tour on the hike and bike trail, stopping at the amazing sights to take pictures and learn about Austin and the history of our great city. After the tour, they will then return to the shop and return the bikes. If scheduled, they will get a shuttle back to their hotel.